Measures: 7 1/2 inches tall (10 inches tall with handle extended ) x 7 inches in diameter. 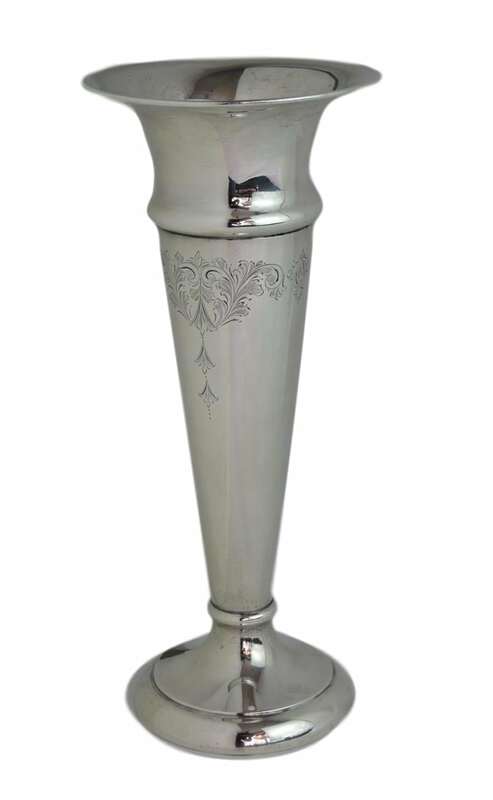 A ‘American Silver Plated – Tipping Lemonade or Ice Tea Pitcher on Stand’ – dates circa, 1870. It features 1 stand, and 1 tipping kettle or ice tea pitcher, in a exquisite ‘Victorian’ design decorated with rich floral, scroll and leaf motifs. The pitcher sits on the stand held by 2 posts and is nicely balanced so that the pitcher tips easily and pours into a glass that you place on the front of the stand. Beautiful condition. Birks Heavy Sterling Silver Pedestal Compote. Dated 1948. 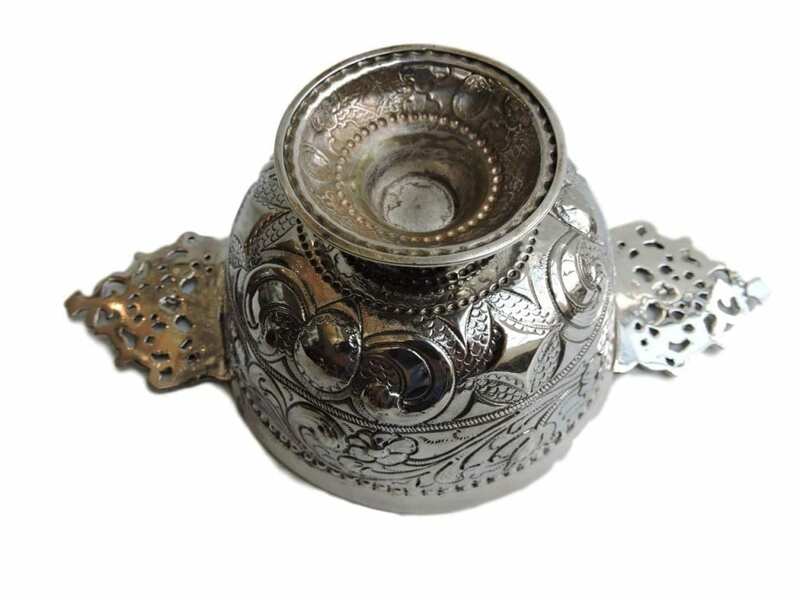 A beautiful vintage compote with a pierced and chased decoration, created by Birks Sterling Company. It features a lovely chased and pierced flower and leaf pattern throughout the border of the bowl, and a ornate styled rim and footed pedestal. Hallmarks featured on the bottom, date it for 1948. Nice and heavy in weight. 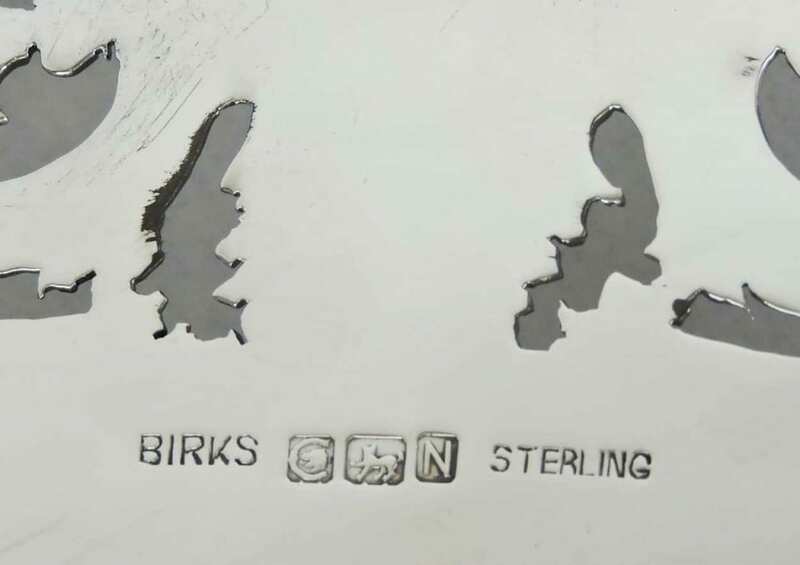 Marked: Birks Sterling with Birks hallmarks. Dated for 1948. Measures: 5 inches tall x 10 inches in diameter x 5 inches wide (from base pedestal). Weight: 854 grams. 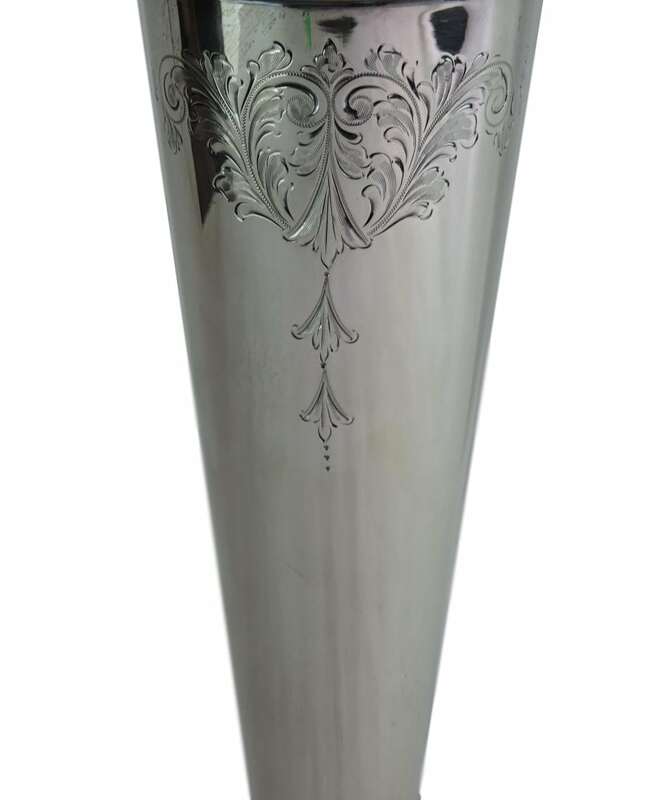 Birks Sterling – Tall Trumpet Shaped Vase With Engraved Floral Decoration – dated 1926. 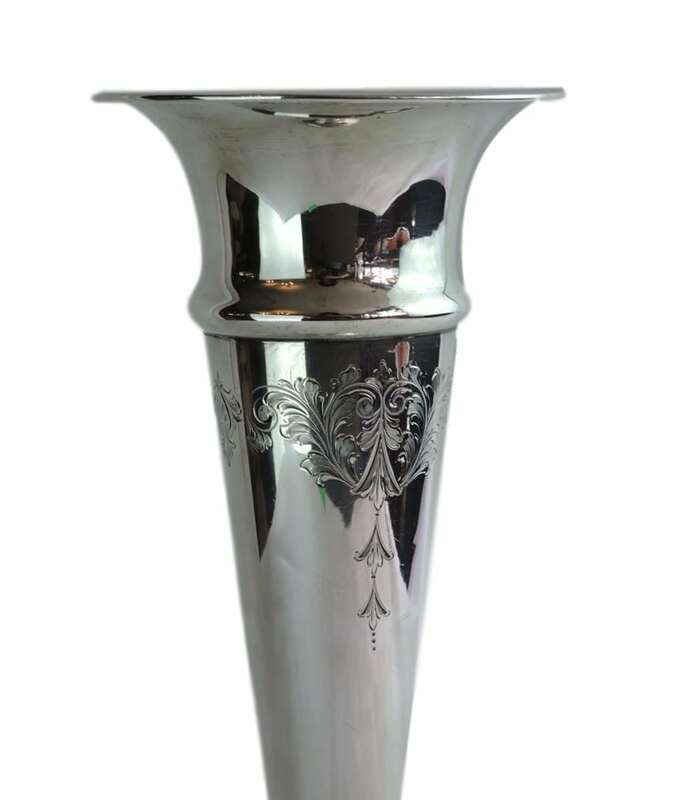 A ‘Birks Sterling – Tall Trumpet-Shaped Vase ‘ – Canadian sterling, dates early 20th century, dated 1926 . 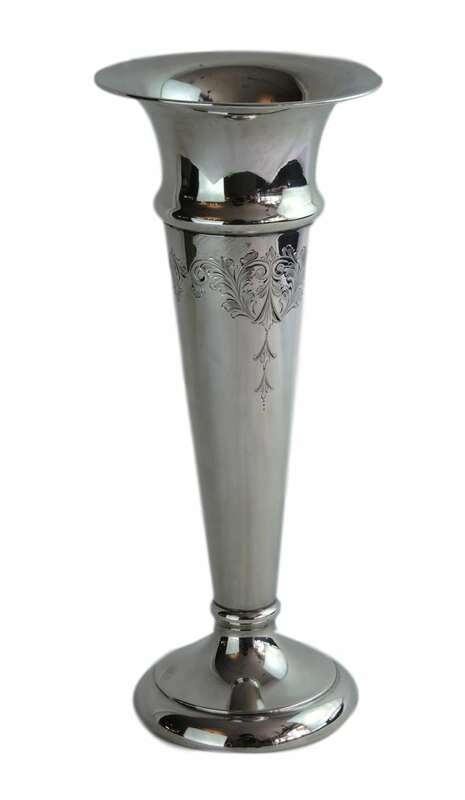 It features an elegant flute-shaped vase design in sterling silver, decorated with a lovely engraved pattern containing floral and scroll motifs. Beautiful condition – perfect vase to accent cut flowers, and the table. Marked. Birks Sterling & Hallmarked with Birks’ hallmarking system for 1926. Measures: 10 1/2 inches tall. 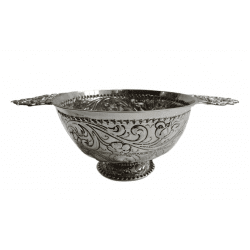 English Hallmarked Sterling – Quaich – dated 1874. 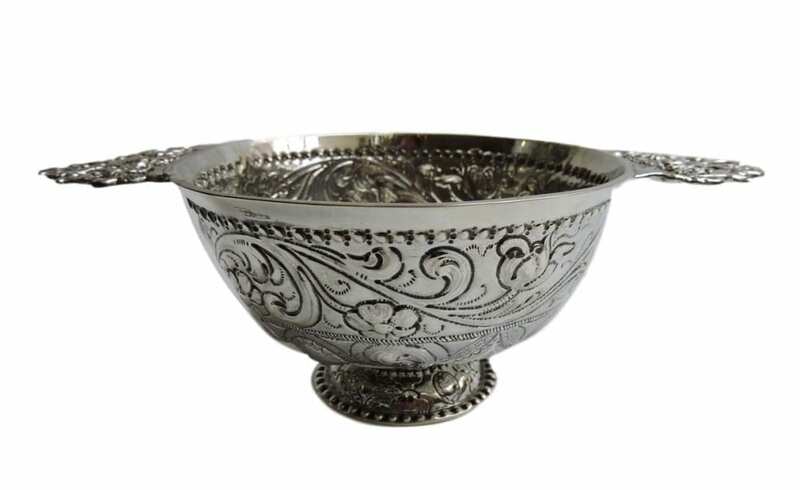 An English hallmarked sterling Quaich (wine, scotch or brandy taster) with hand chased design throughout. Handles are quite decorative. 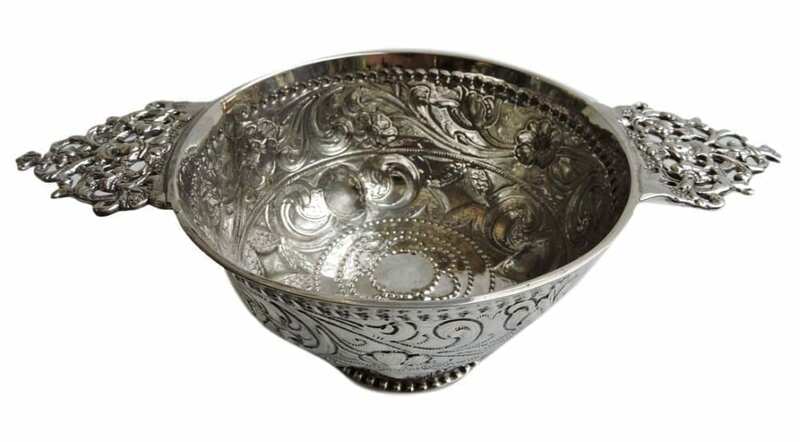 The Quaich derived from Scotland has 2 handles which was a sign of friendship when drinking. Marked. English Hallmarked London, – dates 1874. Excellent Condition – some old professional repairs at handles. A handsome sterling silver tankard with hinged lid and straight sided design, by William Darker, it dates early 18th century during the reign of George II, England. It features a large engraved cartouche containing a decorative monogram in the front centre, a handle with an intricate scroll and ornate thumb design,with hand engraved initials ( possibly belonging to the original owner of the tankard ), and fully marked inside the lid, and the bottom. Marked: English Sterling Hallmarked. London. Dated, 1733. Tiffany & Co – Sterling Silver Chrysanthemum Repoussé Oval Piereced Platter – circa 1902-1907. 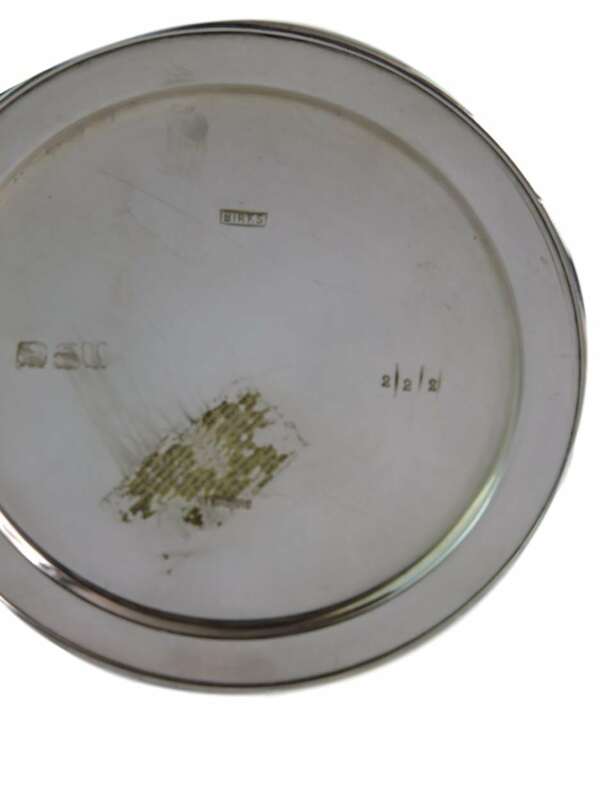 A ‘Large Tiffany & Co – Sterling Silver – Pierced Platter’ with Repoussé Chrysanthemum floral edge. It features a large oval-shaped body with an unusual deep repousse and pierced design, decorated with chrysanthemum flowers and ferns, and embellished with acanthus leaves. In the centre, engraved script monograms, possibly the initials of the previous owner. Marked – ‘Tiffany &Co. Sterling Silver’ (featured on the back). Beautiful condition. Excellent Condition. Minor wear. Monogramed in centre of platter. 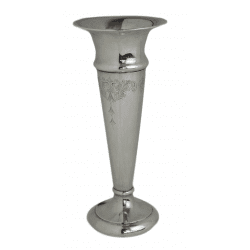 English Hallmarked Sterling cup – London – William IV – made in England – dated 1883. Maker: Joseph Angell & John Angell. Measures: 3 1/4 inches tall x 3 1/2 inches wide. Pair of English Hallmarked Sterling Column Candles. Dated 1911. A ‘Pair of English Hallmarked. Sterling Column Candles’ – dated 1911. Each candle stick consists of a beautiful classical corinthian column design, possibly ‘Art Nouveau’ influence, with a unique square shaped base. English Sterling Hallmarked, City of Birmingham, Maker – J. Sherwood & Sons. Marked. English Hallmarked. Birmingham. Dated 1911. Measures: 10 inches tall x 4 3/4 inches wide. Large Portuguese Continental Silver (.833) Decorative Serving Charger. c.1930. A ‘Large Portuguese Continental Silver (Continental 833. Standard Silver) Serving Charger’ with a beautiful repousse shell, scroll and miniature flower bouquet motif border, on a textured pebbled background – it dates c.1930. On the back, near the centre of the outer rim, it features a circular hook for hanging the platter on the wall. Marked. ‘Portuguese Silver Hallmarks stamps can be found on the outer rim – featured near the black label tape (see close-up image for reference). Measures: 16 1/2 inches in diameter. An ‘Early 20th Century – Pair of American Sterling Candelabras – by Hamilton Silversmiths, New York. Each features a unique candelabra body with a square shaped base, with detailed chased decorations in a lovely ‘Art Nouveau/Art Deco’ influenced design. The 3 arm candelabra is removable to have them as Single Candle Sticks. Beautiful quality. Marked. Hamilton Silversmiths. New York. Measures: 9 3/8 inches tall.